18V ONE+™ LITHIUM+™ HYBRID MOWER is rated 4.9 out of 5 by 27. Rated 4 out of 5 by hysteric from Versatile mower Just bought this to replace manual reel mower that had trouble cutting through my weed infested lawn and too long grass. I also already had some Ryobi 18V tools. I chose this model because it is able to be plugged in as well as use batteries. Unfortunately, this model does not come with a battery or a charger. I also bought a 2-pack of 4Ah batteries at the same time. Using it for the first time with my previous 18v batteries (24Wh), I was not able to run it for more than 5 minutes. I was only able to use it plugged in while my new batteries where charging. It cut through everything in one-pass. The performance was really great. It is also not too loud; not that I would want to run this too early or too late, but it is far from obnoxious. Rated 4 out of 5 by Jason collett from Mostly great Pros: lightweight, compact, works great for smaller properties, the one lever height adjustment is awesome! Cons: 6ah batteries do not work in this product unless you only use one battery. Mower shuts itself off in taller grass so I have to mow on the second to highest setting. Rated 5 out of 5 by Sonnybee01 from A Relaxing Mow I bought this product to replace my last Ryobi MOwer which had a lead acid battery. I found this mower to be lighter and easy to mow with. Also with the lithium batteries the mower did not get as hot. ANd they ran of juice and they had to recharge it gave you time to catch your and sit and have a beer. A relaxing mow. Rated 5 out of 5 by kompfreak from Exceeded Expectations! I was tired of my old reel mower and wasn't interested in gas powered. Investigating other mowers I decided on this hybrid mower. It has more power than i expected, even on longer grass. Haven't invested in more batteries (yet!) but it's nice to be able to switch to corded power for the parts of my yard that are left. It hasn't really been a problem which is fantastic. I'm definitely going to buy more batteries and Ryobi devices because of how satisfied I am by this mower. Rated 5 out of 5 by SoMisfit116 from Light weight! Just recently purchased this mower after my gas one gave out action. I've had my eye on this for some time and finally pulled the trigger on the purchase. I have tried it on different grass lengths and i love how well it handled. The weight is a noticeable difference and i even let my neighbor test it after seeing him struggle to start his gas mower. He as well quickly fell in love with it. Rated 5 out of 5 by Jacqueline D from Great manageability! Just got this mower last week and I love the way I can push this around without it feeling like a chore. No gas, oil or cords to deal with as well unless ,of course, I forget to charge the batteries. I love how I can buy other Ryobi tools and use the same battery system. I look forward to many years of service from this sweet little mower. Rated 5 out of 5 by alexdgreat from GREAT PERFORMANCE I bought this lawn mower 4 days ago and started to use it on my two properties . 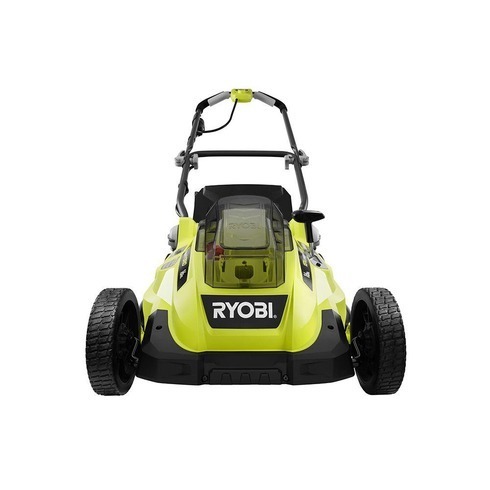 I thought it's performance is the same compare to my previous non Ryobi mower using an 18 volts battery but I was amazed , this tools is awesome and I am recommending it to anyone . 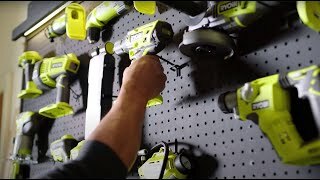 The Ryobi Lithium+ Mowers redefine the 18-Volt category by delivering the power, run time and performance you’d expect from higher voltage lines, while still offering the versatility of the ONE+ system. 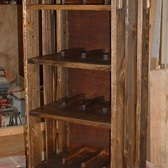 The Ryobi 16 in. 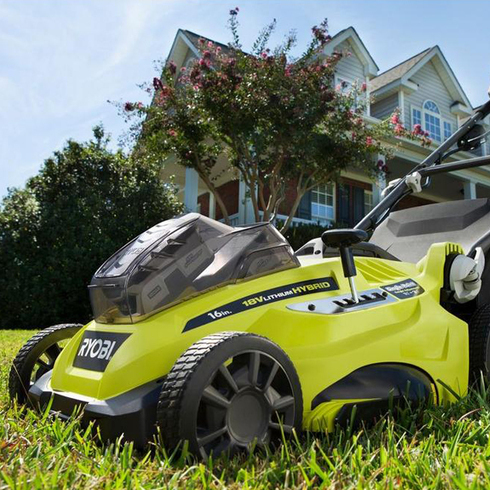 Hybrid 18-Volt Lithium+ Lawn Mower is the first dual power mower in the industry. Its unique design allows you to switch from the included ONE+ 4.0 Ah lithium-ion battery to an extension cord to ensure that you will never run out of power. 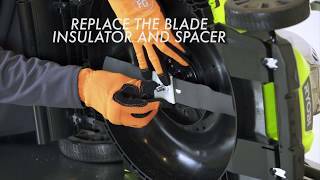 This mower has two battery ports, giving you the option of using a second ONE+ battery to increase the cordless run time. With its simple push button start and single point height adjustment, this mower makes lawn care easier than ever before. Its lightweight and compact design makes this mower ideal for small yards and maneuvering in tight spaces. This mower also has a 2-in-1 mulching or bagging system, allowing you to get the job done quickly and just the way you like. The foldable handle has quick-release knobs, making it simple for those with limited storage to prepare for use and put up. For additional convenience, this lightweight, compact mower has a top-mounted handle, making it easy to carry from one place to another. The 18-Volt Lithium+ battery and charger are compatible with any of the Ryobi 18-Volt ONE+ tools. Backed by a 3-year warranty.